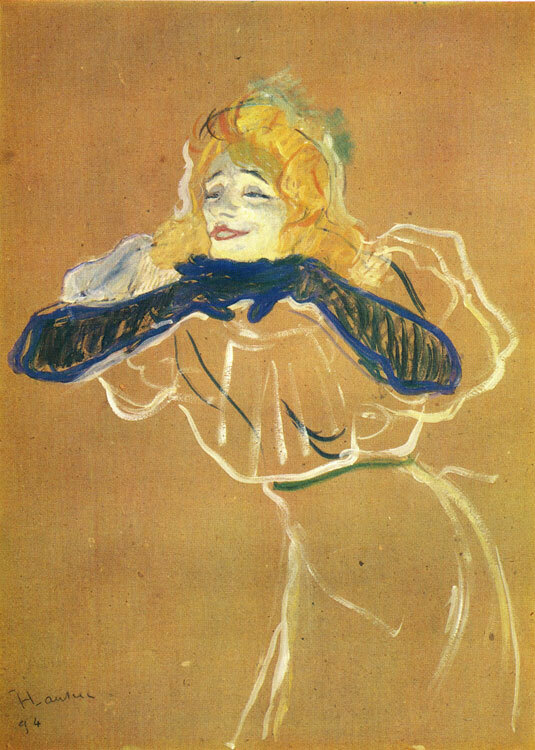 Yvette Guilbert (1867—1944) was one of Lautrec's favorite models. The Moscow work, which shows the actress performing the song Linger, longer, loo, was the first sketch for her portrait to be published in the review Le Rire. The portrait itself appeared in Le Rire (1894, No 7); printed in a small number of copies, it was sent as a bonus to the review's subscribers. The Moscow sketch was intended for Arsene Alexandre, the editor of the review, and remained with him until May 8, 1903, when his collection was sold at the Georges Petit Gallery. The sketch was acquired for the Bernheim Jeune Gallery (No 13183), and later was bought by Mikhail Morozov. In 1910 Morozov's widow presented the sketch to the Tretyakov Gallery in Moscow.